Research demonstrates that children born into poor families are more likely to experience poverty as adults and, in turn, raise their own children in poverty. Acknowledging these trends, programs have started serving parents and children through two‐generation approaches designed to meet both the child development and parental economic security needs of a family to effectively mitigate challenges and support positive outcomes for all its members. Traditionally, the focus for alleviating generational poverty has been on either early childhood education or workforce education and training for parents, while two‐generation approaches focus on both sets of needs. Research indicates that by investing in low‐income children and parents, educational, financial, and social outcomes for both are improved. However, most two‐generation approaches focus on parents and young children, leaving vulnerable adolescents – including the 6.7 million 16 to 24‐ year olds who are neither working nor in school – without support. These “Opportunity Youth” face many obstacles to employment and self‐sufficiency and often come from backgrounds of entrenched poverty and instability. Yet, research shows that they represent a substantial economic opportunity. These youth overwhelmingly want to work, gain education and job skills, become economically mobile, and overcome the cycles of poverty that have historically entrenched them and their families. Opportunity youth are an important population to consider in the context of two‐generation programming interventions because their abilities and opportunities can be strengthened through connection to their families and communities. 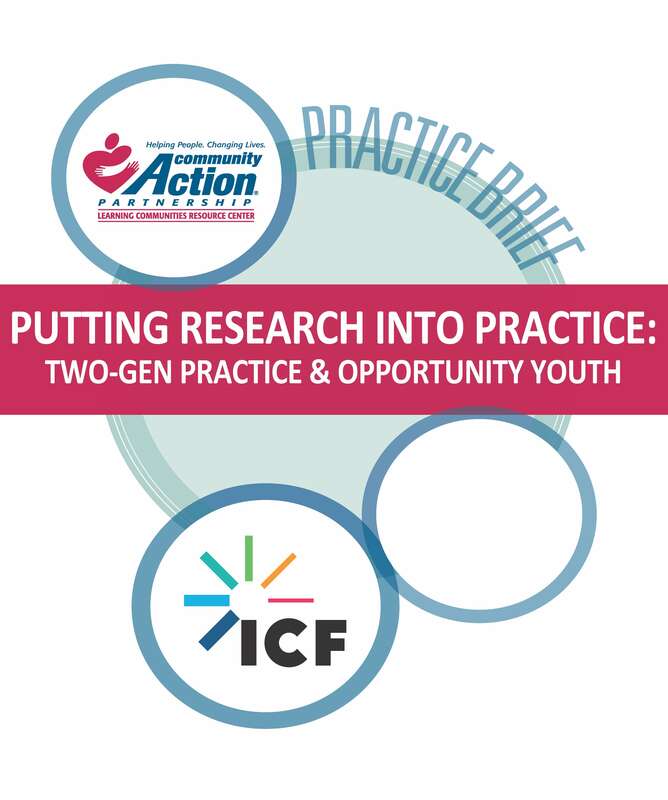 ICF has synthesized research and resources below from the field on two‐generation approaches for opportunity youth, organized into four categories: Two‐Generation Program Need, Opportunity Youth Program Need, Promising Practices for Implementation, and Example Programs.